Last week’s menu gets an A+. I would highly recommend all three recipes. I spent most of the week lunching on the leftover roasted shrimp and spaghetti squash. In truth, we didn’t have much leftover from the lettuce wraps or the carne asada steak with tomatillo and avocado salsa. Those were my husband’s favorites of the week. As much as I detest this Whole 30 nonsense (there, I said it), it is certainly giving me some room to be creative in my menu planning. 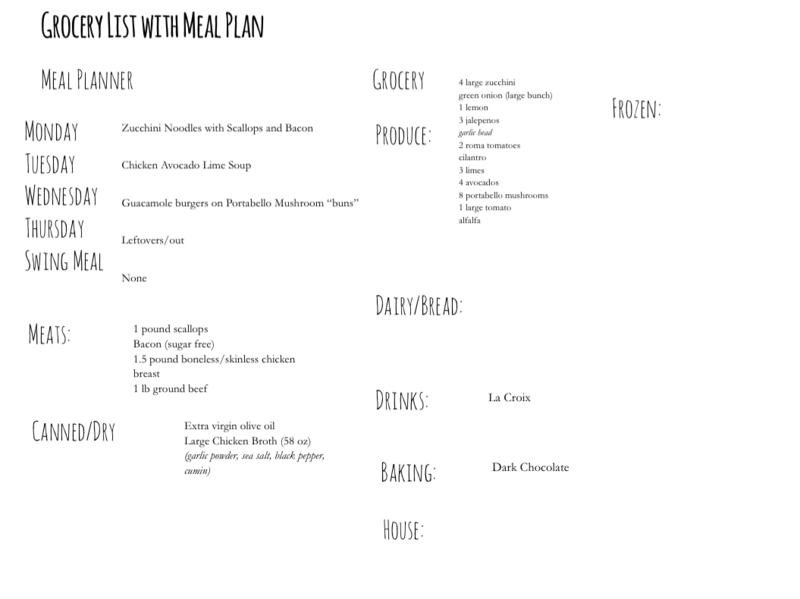 The other part of last week’s menu that I loved is that the cooking was relatively simple and really easy clean-up. These are the reasons to make the entire menu. I came in right at about $100 with the other groceries I had to purchase for the week–not bad at all for the amount of produce and meat I had to purchase. I’m still craving pasta. I still can’t wait for cheesy pasta. This has not (and will not) change. Soooo–I’m subbing cheese for bacon. I guess that’s an ok tradeoff. Monday’s dinner is Zucchini noodles with scallops and bacon c/o meatified. I am pretty pumped about this dish. Tuesday (which is traditionally reserved for Taco Tuesday in our house) is now hosting the Chicken and Avocado Lime Soup c/o Cooking Classy. I really love this soup, so it doesn’t seem like too much of a sacrifice.